Give your bedroom a classic, cottage look that you'll love spending time in with this queen reeded bed. 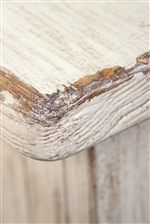 The piece is constructed of hardwood solid and ash veneer in a weathered worn white finish for a beautifully aged appearance. There is an abundance of skilled detail throughout the piece, including the molding atop the headboard and footboard, as well as the grooves in the panels, giving the piece texture and depth. 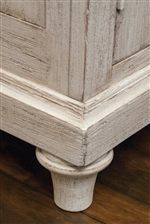 The Aberdeen Queen Reeded Bed in Weathered Worn White Finish by Riverside Furniture at Ryan Furniture in the Havre De Grace, Maryland, Aberdeen, Bel Air North, Churchville area. Product availability may vary. Contact us for the most current availability on this product. 21271 Queen Reeded Footboard 1 69" 5" 33"
21270 Queen/Full Headboard 1 72.75" 6.5" 60"
The Aberdeen collection is a great option if you are looking for Cottage Cottage furniture in the Havre De Grace, Maryland, Aberdeen, Bel Air North, Churchville area.